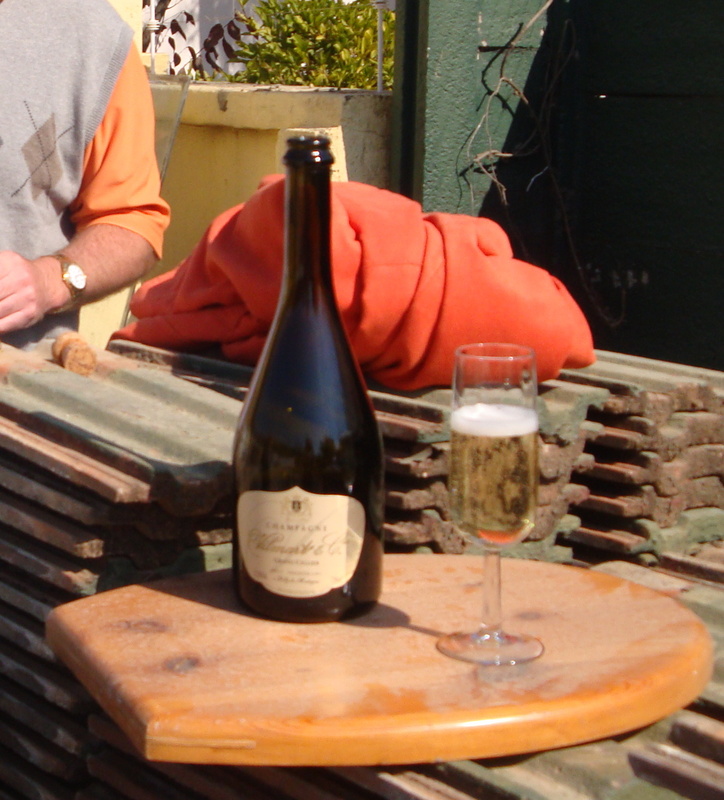 Needless to say the setting, in terms of a champagne celebration, was one of the more unusual we’ve enjoyed. Saturday morning saw us venturing quite far from our usual weekend stamping ground and as the building process moves forward, we’ll probably be doing this more frequently. 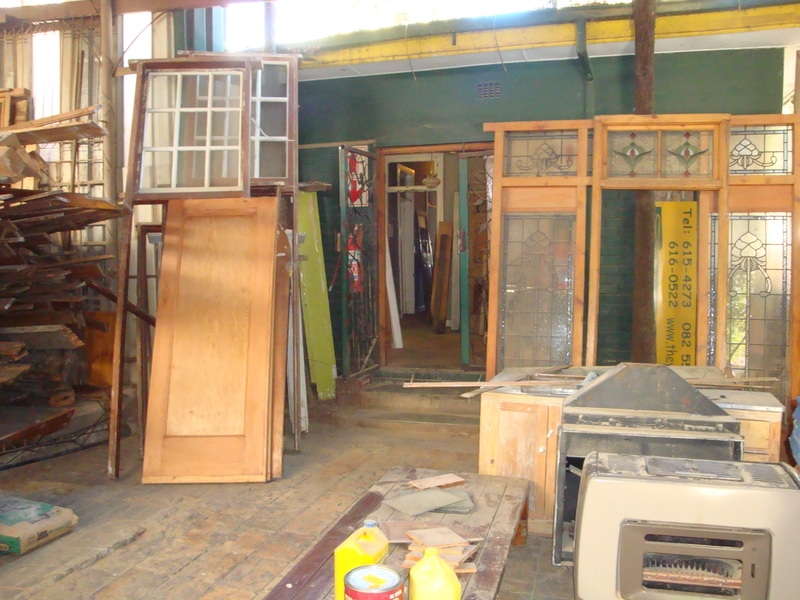 This weekend we drove across to Kensington in the south east of Johannesburg, in search of The Yard which specialises in features – doors, window frames, stained glass windows, floor boards etc – salvaged from demolition sites. We found it easily largely because I went to a birthday breakfast at Pastelaria Princesa there a few months ago and it’s in the same street. One of many crowded rooms at The Yard. The Yard is very interesting and we could easily spot other people just like us trawling through it. 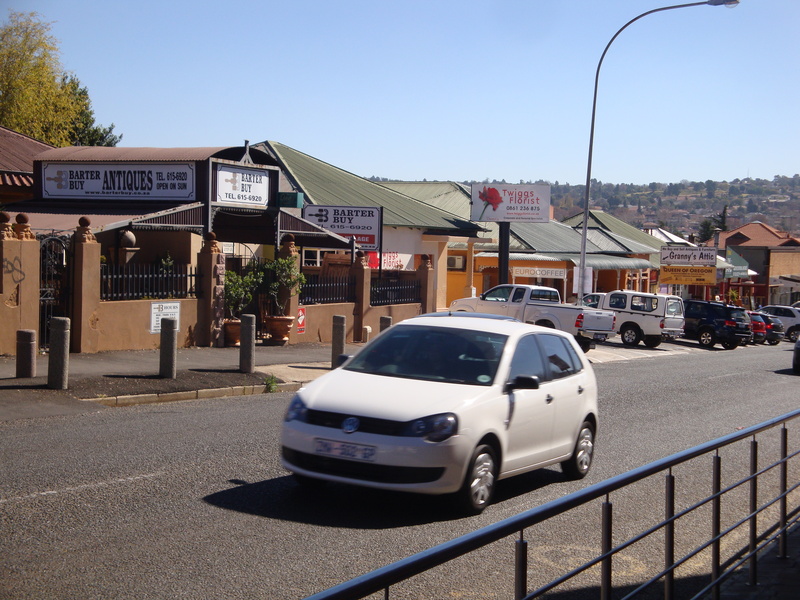 We didn’t see anything that we felt we could use on this visit but did discover an amazing shop directly across the road called Barter Buy Antiques where I could have spent the entire morning. 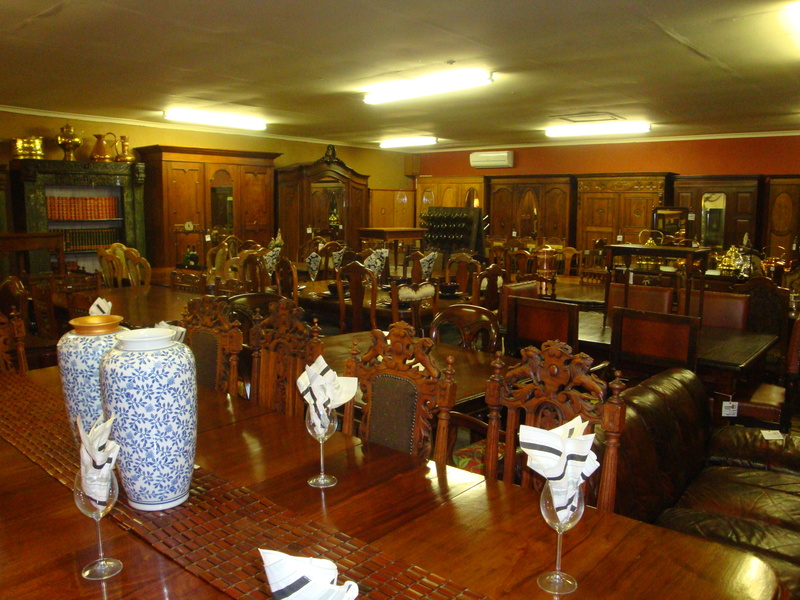 It seems though that a spousal embargo has been placed on furniture shopping until we’ve figured out just where things will fit in the new spaces…. But I’ll be keeping an eye on Barter Buy in the meantime. Pasteleria Princesa, though unprepossessing from the outside, is renowned for its Portuguese breads and confectionery and was an obvious place to have lunch. It’s always interesting to go somewhere in your home town and find yourself in a very small minority. The prevailing language in Pastelaria Princesa is Portuguese. We heard hardly a word of English and felt like visitors in a foreign city. Queens Street in Kensington is lined with little antique and furniture shops, florists and cafes. 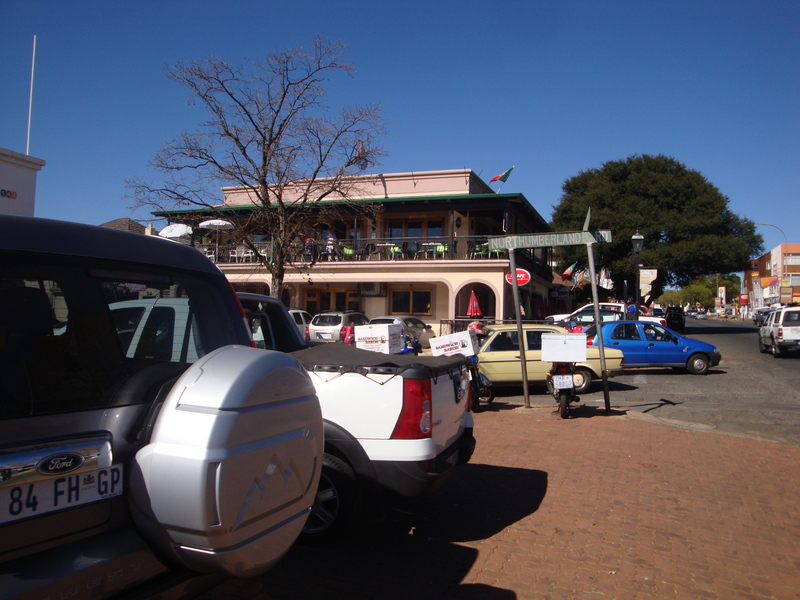 If you’re in the mood for browsing, it’s a good place to spend a Saturday morning under a typical Highveld winter sky. The Yellow Corner building is Pastelaria Princesa. 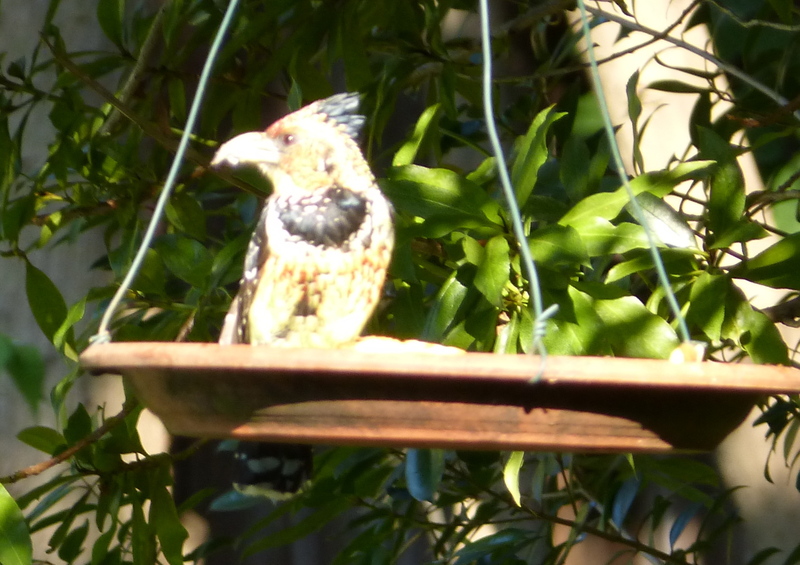 Crested Barbet looking for lunch. The only thing that really concerns me about moving away from our present home, is that I’ll miss the prolific bird life we enjoy here. It probably has something to do with the very old, established trees we have here. We’re moving to a plot that cannot boast a single tree or even a respectable shrub and it will be a while before we can get a garden really established. We have to hope that the beautiful trees in the park immediately beyond our boundary wall will make up for dearth of greenery when we first move in. 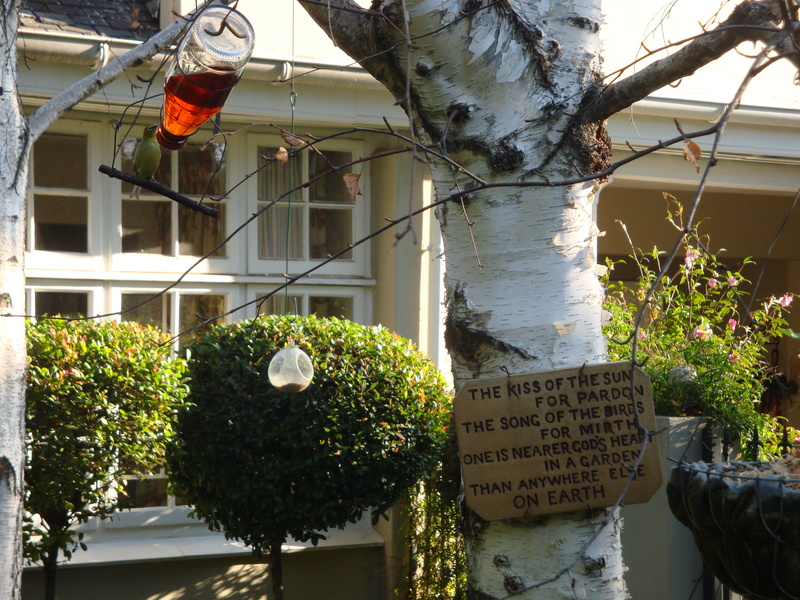 Here is a record of just one afternoon’s activity in our Dunkeld garden. Little White Eye enjoying afternoon (Rooibos) tea. They have a very effective ‘queuing’ system, stacking up in the tree above like planes waiting to land at Heathrow. 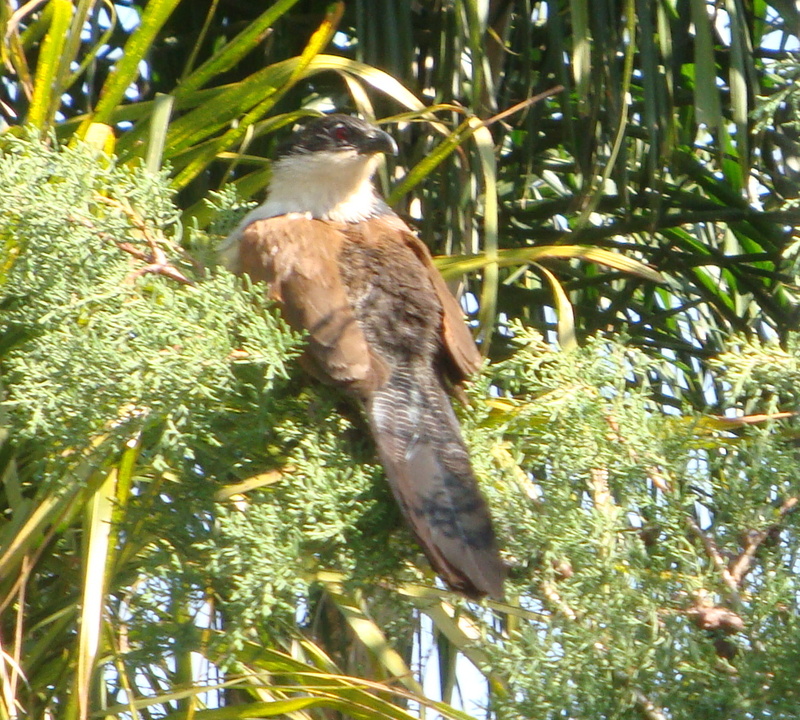 Burchell’s Coucal enjoying a sunny spot. 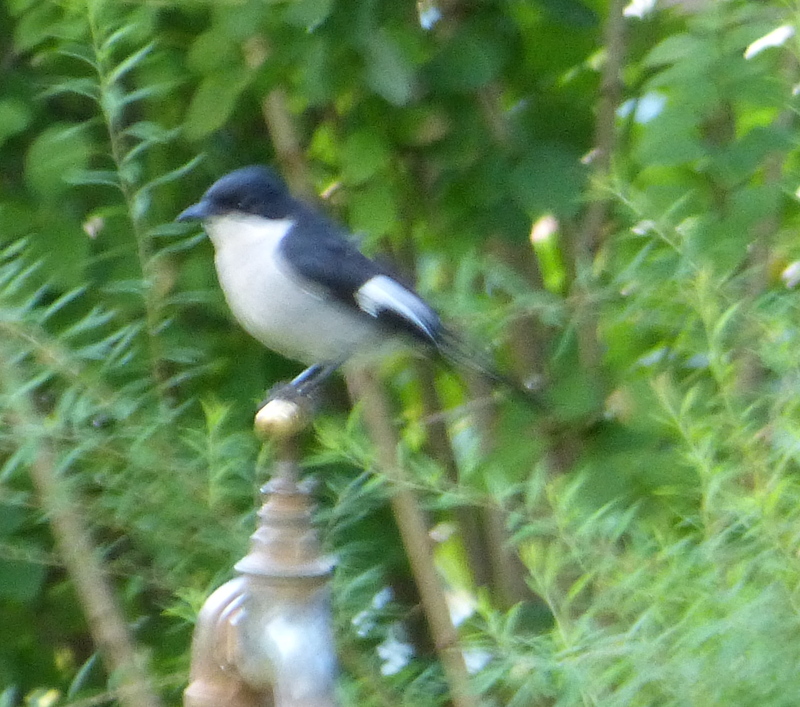 Southern Boubou has only appeared in the last few years. 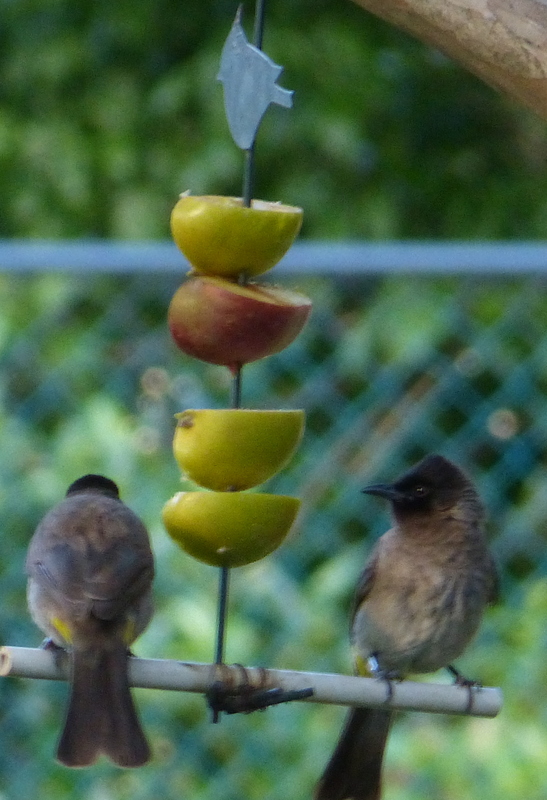 Bulbuls sharing a fruit salad. 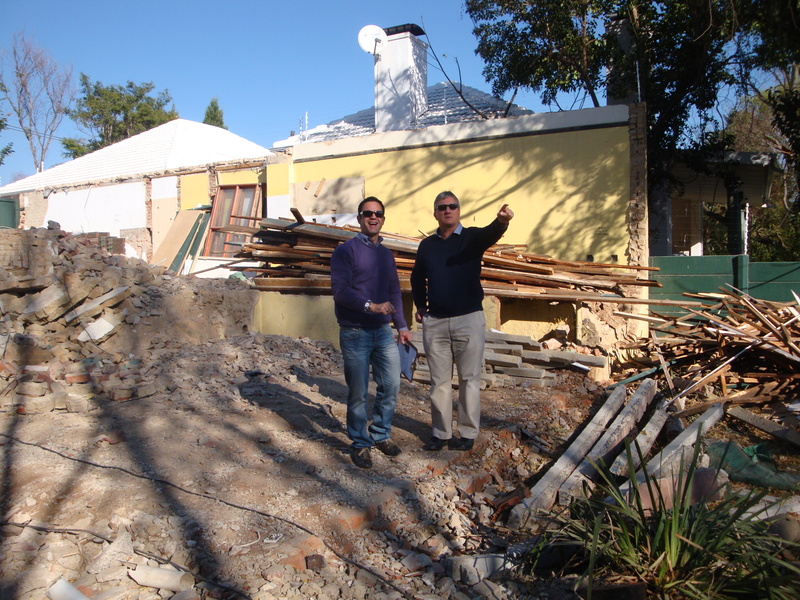 This morning we had a site meeting with Bernard (our architect), our demolition contractor, Mark, who would also like to build the new house and the consulting engineer, Eric, who we had not met before. 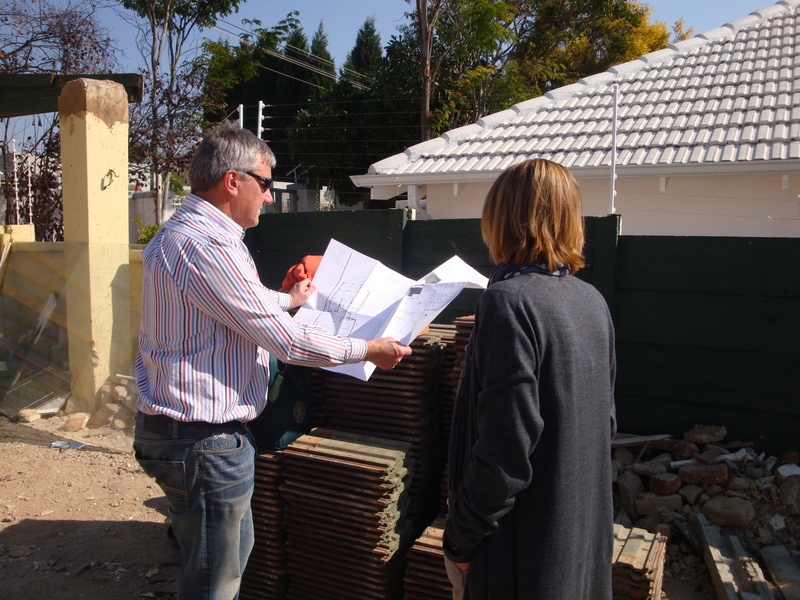 This was mostly to discuss getting the levels on the property right before building can start. The engineer now needs a few more days to work things out more precisely. In the end we will be looking at three separate levels: the first, at street level will be where the cottage will be built. There will be a retaining wall built behind the cottage. The driveway will slope down past the cottage and curve to the right into the garage which will be on the second level, the same as that on which the house will be built. 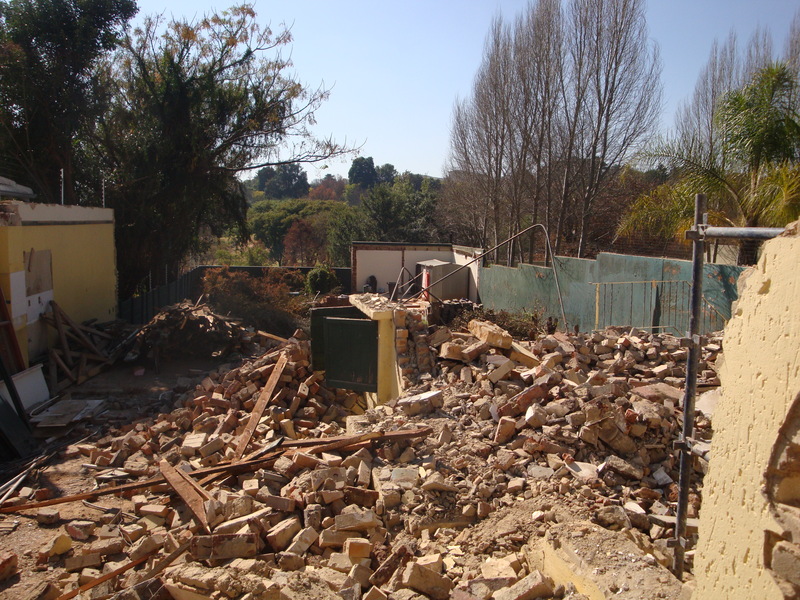 The third level will be the garden which will be one or two shallow steps below the front verandah. Working out where rubble has to be used as filler etc is quite complicated and one thing I am quite sure about is that I don’t want to discover broken bricks and tiles just a few metres down in the garden. 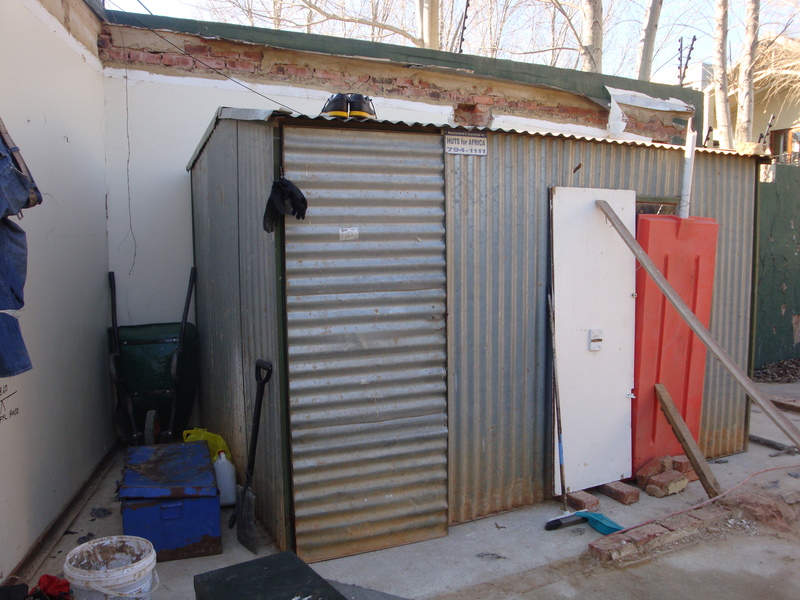 So the preparation of the site is very important and it’s going to take a bit of time to get it right. Today at last we were able to get a very clear view of the whole property from the street down to the garden wall bordering the park. We are thrilled with it. I was also really pleased to hear some lovely bird calls there this morning despite the prevailing wreckage. There were grey louries around and a black collared barbet fluted continuously. Leaving behind the prolific bird life in our present garden is the thing I feel most concerned about so it was reassuring to hear all the singing today. South to North View. I stood almost where the driveway gate will be to take this. It gives quite a good sense of the length of the site. Watchman’s Hut in bottom right hand corner. 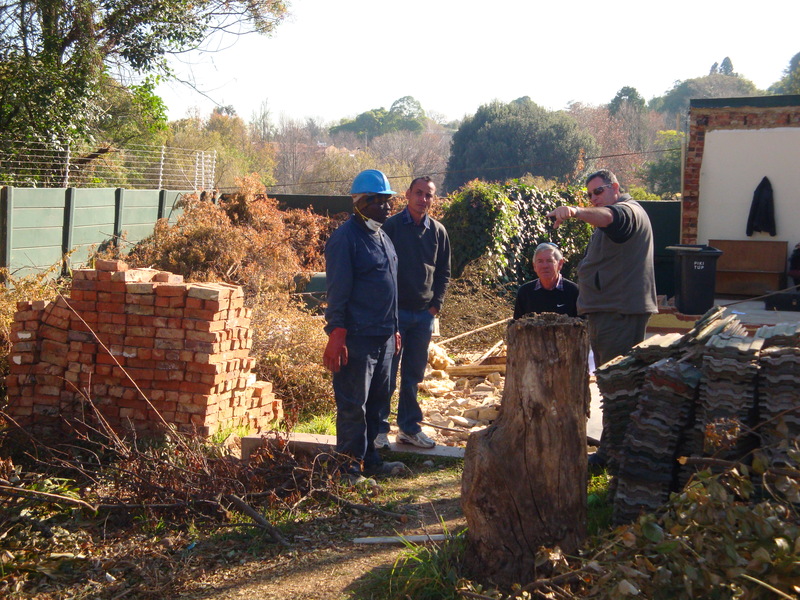 In this last picture we have Phineas who seems to be in charge of the site at the moment, Greg who is one of Mark’s project managers, Eric the engineer and Mark. 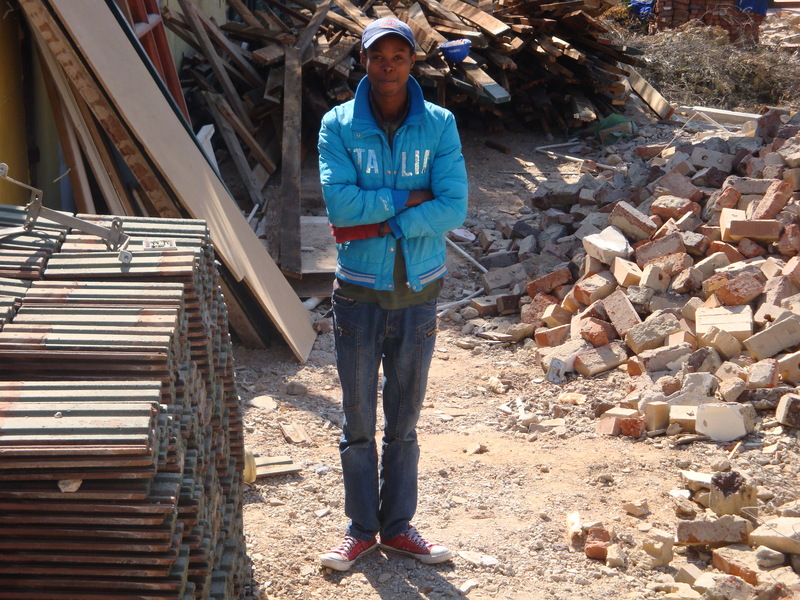 Esprit Contractors have an arrangement whereby they donate salvaged materials like the tiles and pavers here, bath tubs, sinks etc to building projects in the townships. Everything that can possibly be used again, will be. Stacked up bath tubs and a few window frames waiting to go. A few things have happened since I last wrote. The ‘written permission’ from Phrag proved elusive. 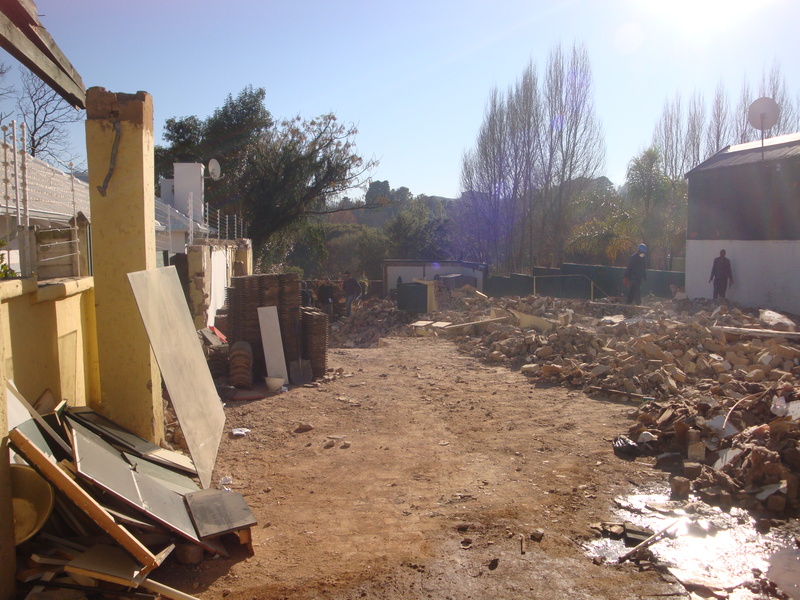 Having heard on Thursday the 9th of May that permission to demolish had been granted, it was Friday the 24th before Bernard was able to actually collect the letter from the Phrag offices. 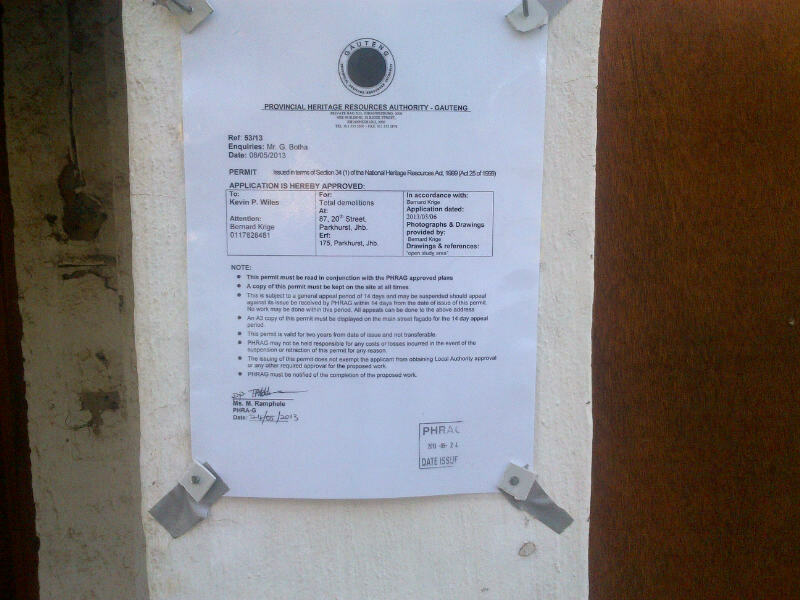 Only when we studied the letter did we realise that a copy had to be posted on the outside wall of the property for a further two weeks before the demolition could begin in earnest. This was to allow for any ‘late’ objections. We wasted no time in affixing the ‘late objection’ letter to the wall. While waiting for that time to pass, we established from the planning department that we needed the neighbours on both sides to sign our plans before we could submit them for approval. Given our previous encounters with our neighbour on the left, this was not good news. We were able to contact our neighbour on the right quite easily and he was delighted to give us his support. He went so far as to say that if we hadn’t bought the property, he would have, if only to ensure that something positive would be done to it. He also asked if we would be prepared to ‘straighten out’ and raise the height of the wall between our two properties and offered to share the costs of doing so. We are only too happy to do this and will be pleased to reduce the number of steps in the wall as it stands now. We deliberately got the “righthand” signature before approaching the “lefthand” one. This was not so straightforward. Neighbour on the left insisted that the plans be dropped off at her office so she could discuss them with ‘her town planner .’ This is somewhat out of the ordinary but in an effort to keep things on an even keel, this is what we did. 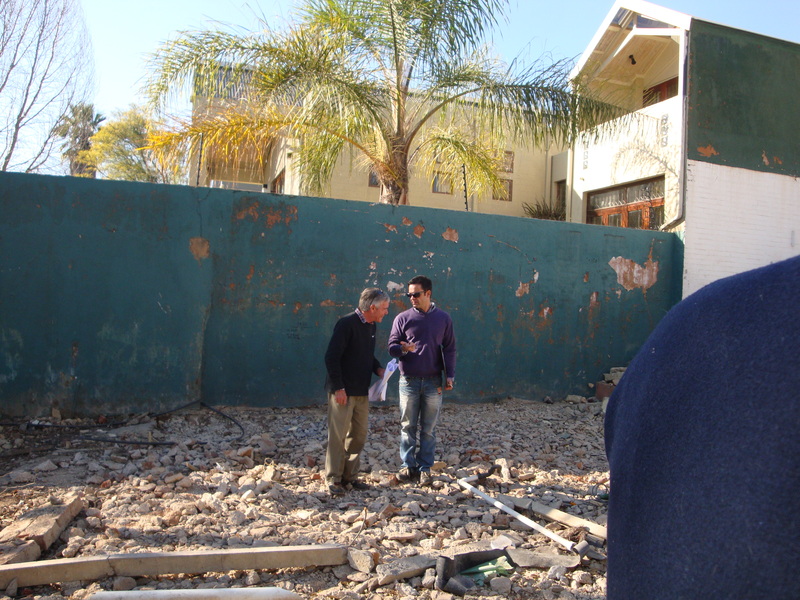 Leading up to this point, we had had several altercations with this neighbour who for reasons that remain quite unfathomable, is insisting that the existing scruffy precast wall between our two properties, remains in place and untouched. This despite our offer to build a new wall, twice as high, plastered and topped with a coping, at our expense. And despite this same neighbour, a few months back, stating in writing that ‘high walls make good neighbours.’ Logic seems to be lacking. Following a particularly difficult confrontation earlier in the year, we stepped back from the “wall debate” and agreed to leave the existing wall as is and looked on bemused as she had electric fencing erected above it. 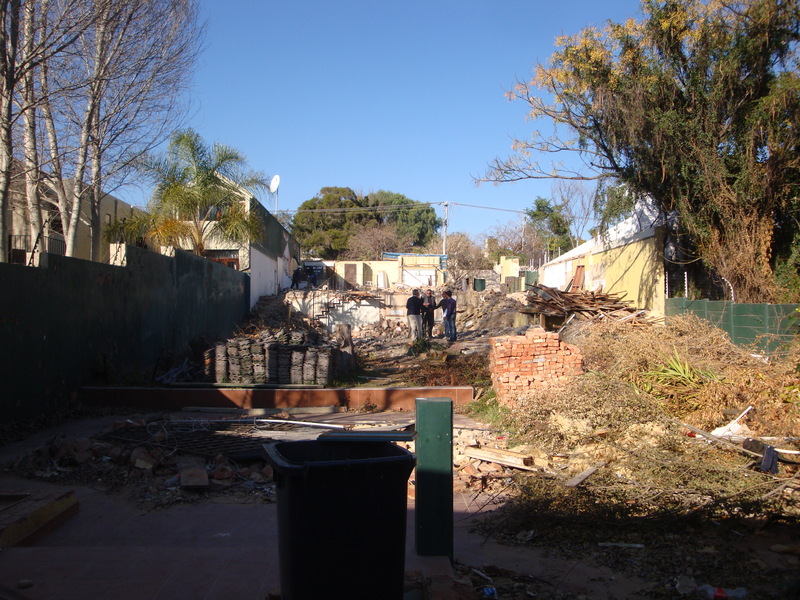 We still believe it would have been in her best interests to have allowed us to build a new and substantial wall between the two properties before the building gets underway, but have been quite unable to reason with her in this regard. 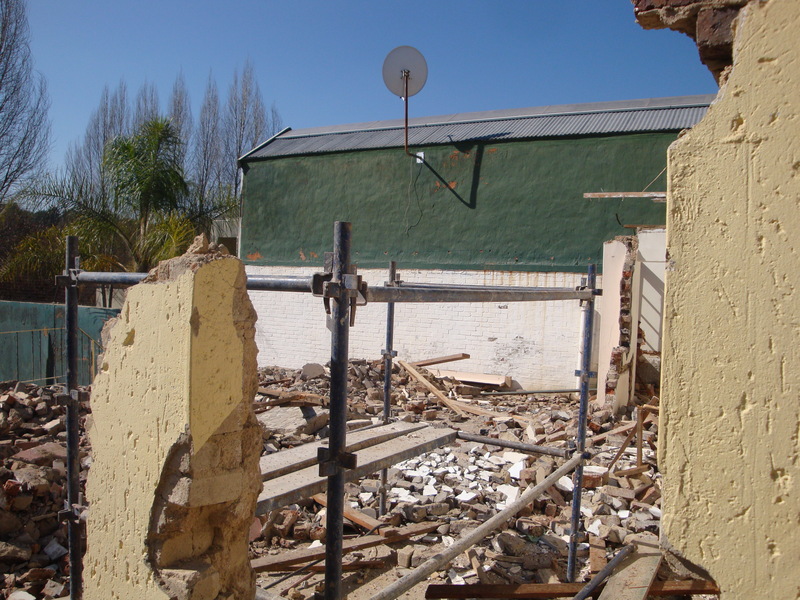 Two days after dropping off the plans, we received an email saying that they were signed and ready for collection on the understanding that her little wall remains untouched. I wasted no time in picking them up before there could be any change of heart and the very next day, Friday the 7th, Bernard submitted the signed plans to the city council for approval. And so the second waiting game begins. View of the site from south to north. The west wall of the house on our right. We’ll not see this once our new house is built. 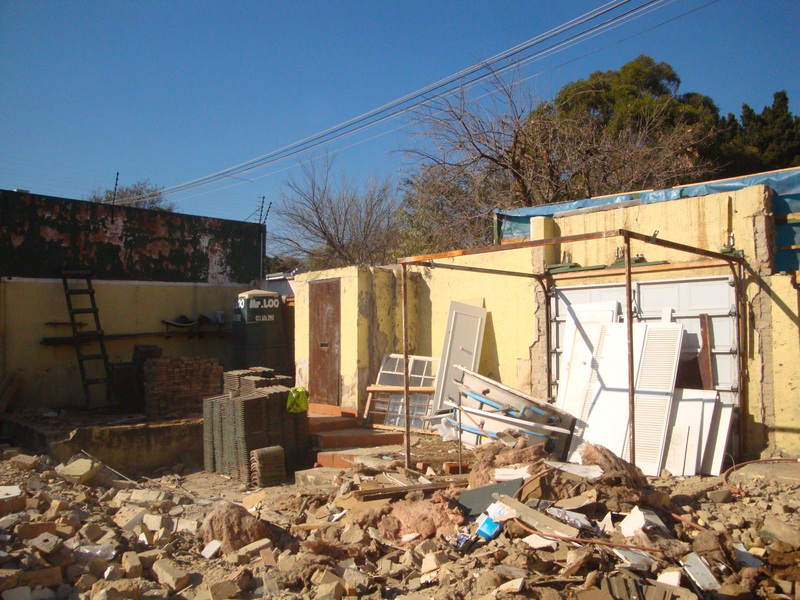 Tags building, house, Johannesburg, Phrag.